Platoon Laser use the latest hi-tech Special Forces MP5 Stinger weapons. 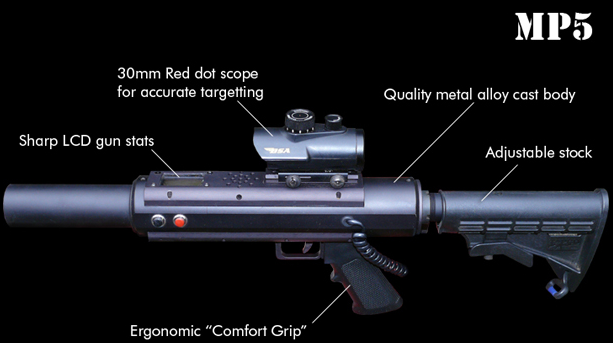 With an alloy cast body, adjustable stock and ergonomic grip, the MP 5 Stinger was designed by Special Forces Operators and also features a 30mm Red-Dot scope for accurate targetting. It is made from 100% aluminium alloy that is CNC milled and machined in the United States using defense department contractors. The guns have LCD displays showing game stats and kill rates.